It has been 10 years since the launch of the iPhone. The iPhone demonstrated how innovation could completely transform an industry and how people and society as a whole relate to technology. Most don’t realise that the first iPhone used already available technology, and didn’t contain a single defendable patent, but the way the package was put together was truly revolutionary. Within a year of release, Apple had overtaken Nokia in sales and market capitalisation to become the dominant force in mobile phone technology – and as they say, the rest is history. 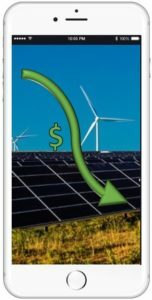 Renewable energy is reaching a similar moment – its ‘iPhone moment’. Technology advances and accumulated expertise in construction and deployment of wind and solar energy have come together in a way that has created a true tipping point in the energy industry. Ten years ago wind and solar power were considered environmentally and ethically desirable, but were still a relatively high cost compared to incumbent fossil fuel generation. But now, renewables have passed the cost tipping point with the fossil fuel family’s cheapest option – coal. The effect is that renewables have become the ultimate disruptor in the energy industry, just the way the iPhone did with mobile telephony. Not only do renewables now present a more favourable business case, they are also dramatically changing the way people interact with energy and its sources – especially wind and solar. The Tipping Point It is widely acknowledged that wind and solar power are now cheaper than coal in many parts of the world. For wind energy, bigger turbine blades, better and cheaper materials, and better use of data have driven multiple efficiencies allowing the technology to steadily raise efficiency and cut costs. For solar, huge increases in scale along with steady improvements in quality control have pushed prices down at an exponential rate, making it likely that it will be the lowest-cost option almost everywhere in less than ten years. This is a process that I have seen from my own involvement in the early days of the industry, from building Ireland’s first wind farm in in Bellacorick in 1992 (it’s still going strong 25 years on) to developing some of the world’s most competitive wind and solar plant in South Africa and Chile. I’ve seen this trajectory with my own eyes and the numbers are compelling. According to analysis by financial advisers Lazard, the cost to build a utility-scale solar photovoltaic plant fell by about 80 percent from 2009 to 2014 while wind projects dropped by 60 percent. More recently, the International Renewable Energy Agency (IRENA) anticipates a further drop of 43 percent to 65 percent for solar costs by 2025. 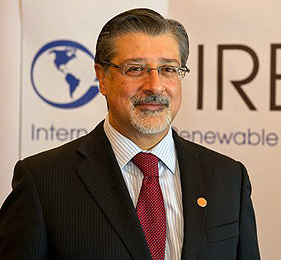 Adnan Amin, IRENA’s director general believes “these are game-changing numbers, and it’s becoming normal in more and more markets”. Based on what we’ve seen at Mainstream Renewable Power, he is absolutely right. Changing of the Guard More and more countries are fast-tracking the transition to renewable energy in order to assure the sustainability of their environment and their economies. China’s pollution crisis is just the most shocking example of the effects on human health and economic activity of the reliance on polluting fossil fuels, and this has in part driven the country’s decision to invest USD352bn into renewable energy by 2020 in a decisive shift from coal. Even in coal producing countries like South Africa, the tide has begun to turn against fossil fuels with renewables quickly picking up ground as a preferred option for investment. Wind and solar projects have reached a level of cost competitiveness where they are cheaper than new coal. 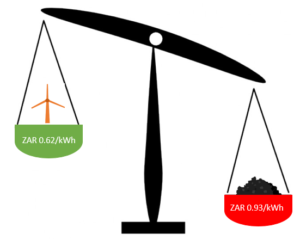 Data from recent competitive tenders shows wind at a cost of 0.62 Rand per kilowatt hour compared to coal at a cost of 0.93 Rand per kilowatt hour Coal-fired plant currently under construction by Eskom, the national utility, is estimated to cost 1.20 Rand per kilowatt hour. In Chile, in 2016 the renewables sector underlined its competitiveness where, led by Mainstream, it won 27% of the capacity offered in the electricity tenders with prices as low as US$38.8/MWh significantly undercutting the incumbent fossil generators. But this is just the beginning. The War is Over – people just haven’t realised Although new coal plant are still planned in some parts of the world, the war has effectively been won. The business model for coal is failing, as ever larger numbers of upstream and downstream projects are now deemed uneconomic, and investors are growing increasingly worried about stranded assets and decommissioning costs. Now is the time, as the smoke of battle between old and new generation clears, to put in place a framework which will underpin the next growth phase for renewables. The switch from fixed tariffs to competitive auctions over the last five years has driven huge cost savings within the industry to the significant benefit of the customer. However, as with the iPhone the next range of customer benefits will come not from continued dramatic cost reduction in the hardware, but from ancillary services, such as storage, demand side management and increased system flexibility. The Airbnbs, Ubers and Twitters of the electricity industry are being born all around us, and these will drive the next wave of innovation and customer choice. As these new markets develop it is important that we avoid a “race to the bottom” in the delivery of new renewable plant. There is a balance to be struck between cost and delivery, and while that balance is in equilibrium in most markets, it only takes one obstreperous utility incumbent, a dithering regulator or a delayed planning process to raise the risk profile of the project and tilt that balance away from the developer and the customer and raise costs. I am confident that governments and renewable energy companies like ours recognise that it is in everyone’s interest, from investors to customers, that projects are delivered and companies are protected against delays that can damage project economics. While at the time of its launch the iPhone was hailed as an interesting product and a challenge to incumbents, few predicted the dramatic pace of change that it ushered in. The Smartphone is now ubiquitous, and it has created entirely new companies and services that didn’t exist before its launch. Renewable energy is at that same launch point – and the next ten years will both consolidate its place in the electricity sector, while delivering a range of new opportunities for customers across the world. All at the same time as helping us meet our overriding climate change objectives. That is a world I am looking forward to help to deliver.